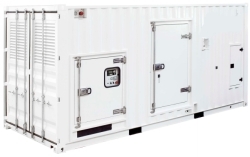 Container power generators are available with a rated capacity of 30 kVA to 3000 kVA. Depending on the asked performance and execution, the generators are mounted in soundproof, weatherproof ISO container with a length of 10', 20' or 40'. If desired, particulary compact container units can be delivered depending on the required power, also in intermediate sizes fo 12', 25' or 30' foot container versions. Particularly if extra low noise levels are achieved and there should also be enough space for commodious maintenance working in the container, special oversized containers can be build. MITTRONIK Engineering is specialised in customized solutions. The container generators are fully operational supplied, including air-intake, exhaust system and silenced muffler, tank, control panel and accessories such as lighting and fire extinguishers. Apart from the preparations for the load connection no further construction work at site is necessary. The container built-in control panels are based on the intended use, e.g. manual/stand alone operation, emergency/standby or parallel operation. In parallel mode (GenSet-GenSet), up to 32 generators can be used as 'Power-Plant'.